A man's in love with a woman, only the woman is engaged to someone else and asks the male friend to be her Maid of Honor. He agrees, with the intent of winning her heart for himself. 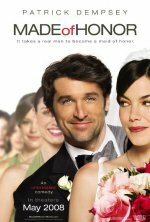 Made of Honor release date was Friday, May 2, 2008.